Have we finally learned how to stop worrying and love The Bomb? Will you help us celebrate our 18th birthday with a gift? Will you help celebrate rabble’s 18th birthday? 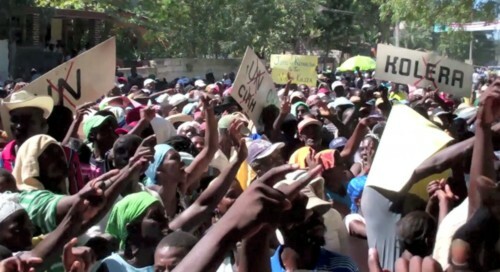 Decem­ber 9, 2011: Angered by the UN-caused cholera epidemic that has claimed thousands, Haitians rallied at the UN Sta­bi­liza­tion Mis­sion in Haiti (MINUSTAH) Base at St. Marc. Photo: from a video produced by Nick Strat­ton, Bureau des Avo­cats Inter­na­tionaux. Watch it at http://ijdh.org/archives/24340. Two years after an earthquake killed 158,000, the majority of Haitians continue to battle against hunger, disease, homelessness and political repression. Half a million people remain in refugee camps and many thousands who have found other accommodations are living in buildings that have been designated as unsafe and requiring demolition or major repairs. Clean water is unavailable to almost half the population and sanitation, in the form or latrines, is available to only 34%. It is a formula for disease, and the 2010 cholera outbreak, traced to the criminally negligent sewage disposal practices of UN troops, sick­ened nearly 500,000 peo­ple and killed more than 6,500 oth­ers. $4.5 billion was pledged for bilateral recovery in 2010, 2011 (plus $1 billion for debt relief). As of Dec, 2011, $2.4 billion of that was delivered. Donors have dispersed an additional $560 million in recovery assistance. Cholera treatment funding of $172 million has been promised; $130 million has been disbursed. If you want to know more, watch my video report.